Figurative fine art collage by artist Elizabeth St. Hilaire Nelson. Elizabeth tears bits and pieces of hand made, hand painted and found papers and adheres them to wood panel, then varnishes the surface. Some small collages, as well as note cards, a DVD on her process, and unique items are put up for sale on Elizabeth's blog. 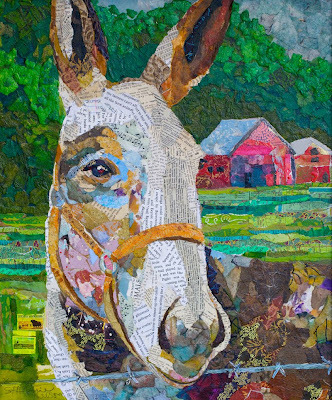 Also, visit Elizabeth's website to view more collages.